Powers/Abilities: Based out of their hive but swarming over the planet surface, the drones served to protect and gather food for the Hivehead, and to follow any orders from their Hivehead. Their minds were not amenable to being read. They have two sets of arms, and a short, taper to their exoskeleton dipping down like a tail (or almost the back of a tunic) behind what would otherwise be the buttocks of a biped. Their maxilla (upper jaw) has two prominent, squared-off "teeth," and their mandible (lower jaw, joined like most vertebrates) has a single squared-off "tooth" that fit between the two upper "teeth." Their elbow, shoulder, knee, and possibly hip joints were somewhat thickened in spherical fashion. They have no visible nose or ears, and there did not seem to be an obvious physical differences between males and females (possibly all the drones were males). Both the Hivehead and the drones were covered with (presumably) chitinous exoskeletons, and they made a constant "cht" sounds. Traits: The queen lived only to eat and reproduce, and the drones lived only to feed and protect their queen. The insectoids swarm all over their world, and even hills, caves, etc. appeared to be formed from carcasses of creatures not consumed by the queen. Average height: Approximately 5'5" (they appeared to be shorter than the 5'11" Raza, but they were crouched and oddly placed, making clear reference difficult. The "Hivehead" was perhaps 50' tall. (X-Men: Spotlight on Starjammers#1 - BTS) - When coerced into revealing where his ship was headed by Corsair of the Starjammers, 000020, commander of an omega class freighter, unwittingly said "Phalkon" (an archaic name for the Phoenix Force) without voicing the proper codes. As a result, a quartet of map pods containing information on how to locate the Phalkon were transported to four different worlds, including Ch"rp; a fifth map pod containing a homing beacon was sent to Chandilar (the Shi'ar homeworld), so that the Starjammers had to rush to get the Phalkon before then-Shi'ar ruler Deathbird. (X-Men: Spotlight on Starjammers#1) - Binary and Raza were sent to Ch"rp. (X-Men: Spotlight on Starjammers#1 (fb) - BTS) - For days, Binary and Raza fought to get through the mass numbers of insectoid drones while Raza's sensors tracked the map pod; they made slow but steady progress. The drones had largely been oblivious to their presence. (X-Men: Spotlight on Starjammers#1) - When Binary took to the air, the drones grabbed her, pulled her down, and swarmed over her; and when Raza attempted to come to her rescue, they swarmed over him as well. Binary blasted the insectoids off them both, but new insectoids swarmed back over Raza, who was lost to sight. Figuring the insectoids were taking Raza to the same place they were taking the map pod, Binary allowed the insectoids to drag her along with them as well. (X-Men: Spotlight on Starjammers#1 - BTS) - Having lost the link to Binary and Raza, Xavier/Waldo (the consciousness of the comatose/seemingly dead Xavier bonded to the robotic Waldo) scanned the planet, but only detected a strange buzz, which became more painful as they neared the oddly shifting landscape. Xavier/Waldo's consciousness went in for closer examination and lost contact with the Starjammer. (X-Men: Spotlight on Starjammers#1) - The insectoids brought their captives back to their hive, the walls of which appeared to be formed from insectoid carcasses, and they soon glimpsed the "Hivehead." Disgusted upon seeing it consuming drone carcasses, Binary threatened to attack the Hivehead, leading the drones to swarm over her again. Binary fought free and prepared to slay the Hivehead , but Raza -- sensing the map pod was in the Hivehead's vicinity -- used his sword's hilt to deflect Binary's blasting arm so that she struck herself, instead. However, as he scanned further for the pod, he saw one of the drones place it in the Hivehead's mouth, and she swallowed it. While Binary prepared to blast the map pod out of the Hivehead, Raza's internal computers worked to communicate with the hivehead. 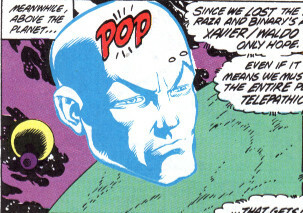 Xavier/Waldo's psychic projection then arrived, warning that they had to get back to the Starjammer, as it needed to get its shields up to protect it from attack. Nonetheless, Raza convinced Binary to hold off while he had Xavier/Waldo to scan the hivehead for the map's information. Finding telepathic communication with the hivehead much less painful than linking to the drones, Xavier/Waldo gained the information that they needed, after which Binary and Raza were transported back aboard the Starjammer. Comments: Created by Terry Kavanaugh, Dave Cockrum, and Jeff Albrecht. I don't know why the insectoids couldn't be known as the Ch"rp as well (or, the Cht), but that's unconfirmed. Binary also called the Hivehead "monster" and "yuchoid"
The cover showed the insectoids with red eyes, but they were green in the issue. There is an insectoid member of the Imperial Guard seen only in a few panels of X-Men I#107 that could be a member of the insectoids of Ch"rp...or not. The Hivehead seemed to have an endless appetite, as the drones constantly brought her food -- anything they could find. When drones perished, she fed on their corpses. The Hivehead also seemed to be almost constantly spawning new drones, which necessitated her voraciousness. The Hivehead did not appear to move physically (beyond chewing), instead directing the drones to bring things to her and place them in her mouth. Sentient, the Hivehead recognized objects or beings as important or dangerous, and she mentally guided the hive mind of the drones as needed. Upon consuming materials, they were swiftly incorporated into her body and mind; by consuming computer data (or some other form of data), she gained the knowledge contained in therein. Xavier (at least while his mind was bonded to the computer Waldo) could read the Hivehead's mind and collect such information. She has two sets of arms, and a short, taper to her exoskeleton dipping down like a tail (or almost the back of a tunic) behind what would otherwise be the buttocks of a biped. Her back was not observed, so we don't know if, like the drons, she has spiny projections over what would be the thoracic spine in a humanoid. Her maxilla (upper jaw) has two prominent, pointed "teeth," and her mandible (lower jaw, joined like most vertebrates) has a single blunted"tooth" that fit between the two upper "teeth." Her elbow, shoulder, knee, and possibly hip joints were somewhat thickened in spherical fashion. They have no visible nose or ears. Ch"rp is a planet in an unidentified star system and galaxy (although the Shi'ar galaxy seems most likely). See the Aquanox profile for clarification on this. We only have a partial view of the planet's surface from space, and even the surrounding stars and constellations are obscurred by the astral form of Xavier/Waldo. The planet is home to and insectoid race, and the surface seems to be entirely covered by insectoid drones who serve their giant Hivehead leader. When a map pod to the Phalkon was sent here, Raza and Binary were transported to obtain it. Following conflicts with insectoids, Raza and Binary recovered the map information and teleported back to their Starjammer ship. The hive base of the insectoids housed the Hivehead. It was composed of insectoid carcasses.